Strips of textile are made from cotton woven in the villages, from where Kader usually collects it as it’s cheaper than from buying it in the market. Later the fabric is stitched together to make larger pieces of fabric. 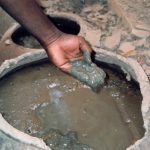 The fabric is then dipped four times in to a solution made from cooking leaves of the Ngalma tree. 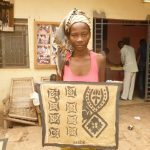 This process acts as a fixative for the dye that comes from painting the treated fabric with the mud from the river Niger, which has a high iron content. A reddish colouring is obtained using leaves from the Npekou tree combined with mud and wood ash. When it has dried in the sun, the mud is removed to reveal the beautiful pictures and designs characteristic of Bogolan cloth. Some times designs use ancient symbols or ideograms used by different ethnic groups to represent key aspects of life such as the earth, the sun, the moon, ancestors, fire, truth, man, woman and many more. PAD sells Bogolan items to visitors, but since the tourist industry is in decline visitors from the UK return with bags full of items for sale, which can be accessed through the Mali Development group or this website. All proceeds go to support PAD activities. 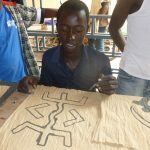 Recently exhibitions have taken place in Bamako and France, where Kader sells his own work alongside that of the children, with a share of the proceeds going to support PAD reserves.